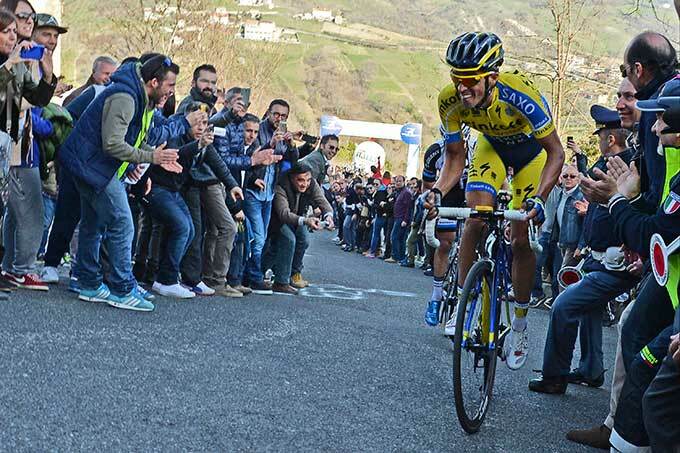 2013 was an appalling season by Alberto Contador‘s standards. He won just one race all season. And although he was fourth overall at the 100th Tour de France, outside of the time trials he did not finish in the top five once. In truth, he wasn’t even Saxo-Tinkoff’s strongest rider at the Tour: Roman Kreuziger was. Many people – myself included – questioned whether he was a spent force. We were wrong. I’m not going to say he’s back to his very best – not yet, anyway. Yes, he won both major summit finishes here. But Selva Rotonda falls well short of hors catégorie. And the Muro di Guardiagrele is super-difficult but short. However, that’s not the point. The point is that, on the decisive fifth stage, Contador attacked fully 32km from the finish. You can count on your fingers the number of riders who would dare to launch such a move. It takes a special confidence to attack like that, and a special talent to make it stick. The 2013 model Contador couldn’t have done it. The 2014 model did it with panache. Can Contador be as devastating on the long, gruelling climbs of a three-week grand tour? Uncertain. But Chris Froome will have been watching and making a mental note to upgrade Contador’s threat potential for July. He is a contender once more. Game on. He blew up on stage five, but Michal Kwiatkowski followed up his Volta ao Algarve and Strade Bianche victories with what was for me an even more impressive showing on stage four while defending the maglia azzurra. I’ve been championing the 23-year-old Pole since early last year, when he finished as runner-up to OPQS teammate Tony Martin in the Algarve race. He went on to record top five finishes at Tirreno, Amstel Gold and Fleche Wallonne, before finishing an impressive 11th at the Tour. He’s already an explosive climber on punchy uphill finishes, and he’s also a top-tier time-trialist (fifth and seventh in the 2013 Tour’s two ITTs). He’s so versatile that he could become either a top classics rider or a grand tour contender. On the long final climb of stage four, Kwiatkowski was left isolated as both Movistar and Tinkoff sent attackers up the road to put stress on the leading group. Kwiatkowski was dropped several times but he never gave up and kept clawing his way back. Ultimately he finished just ten seconds down on stage winner Contador. It was a gutsy ride that showed how much heart as well as talent this young man has. In fact, he reminded me very much of another young rider: a yellow jersey wearer at the 2004 Tour who rode through the Pyrenees constantly yo-yoing off the lead group but always coming back for more. His career has been characterised by never-say-die determination ever since. Whatever happened to Thomas Voeckler, eh? I think Kwiatkowski is even better. I’m not sure we’ll see a steeper climb than the Muro di Guardiagrele all year. Stage five’s concluding test was only 610 metres in length but averaged a lactic acid-inducing 22.2%. Even Alberto Contador was soon reduced to ‘paperboying’ to and fro across the road, as he was slowed to the pace of a gentle stroll. Thankfully the assembled crowds gave the riders space and I didn’t see anyone offering a push – at the pace they were going even a gentle shove could have tipped them over. Words such as spectacular, brutal and legendary are bandied around too often in sport. This stage and its final climb unquestionably qualified as all three. One of the best stages we will see all year. On paper, we should have had two opportunities to see the first three-way showdown of the season between the fastest sprinters in the world: Mark Cavendish, Andre Greipel and Marcel Kittel. Sadly it was not to be. Only Greipel contested the finish of stage two, after Cavendish was boxed in and Kittel crashed, venting his disappointment with a bike-throwing tantrum. And on stage six Kittel was detached from the main group while Greipel was delayed by his own teammates crashing late on, leaving Cav and Mark Renshaw to celebrate an OPQS one-two. Given the trio’s likely race schedules, odds are we won’t see them racing together again until Yorkshire in July. A shame. 2 – Omega Pharma-Quick Step won the opening team time trial for the second year running. 30% – The gradient on the steepest sections of the Muro di Guardiagrele, the concluding climb of stage five. 5 – Adriano Malori‘s victory in the concluding stage was the fifth time trial win of his career, but his first at WorldTour level. In so doing, he beat all three medalists from last year’s World Championships ITT: Martin, Wiggins and Cancellara. 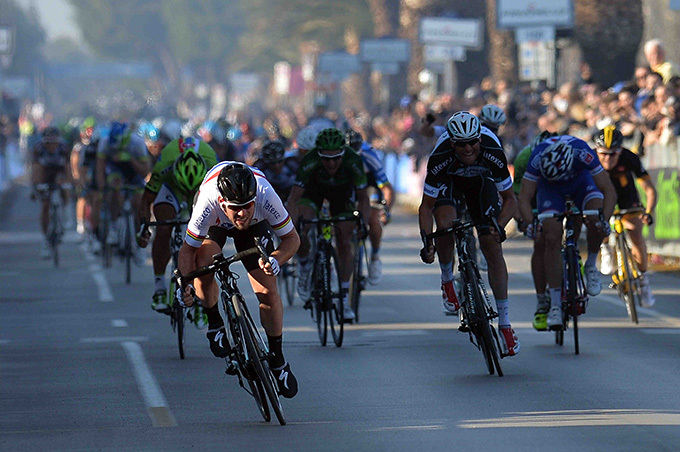 Stage 1: Winner – Omega Pharma-Quick Step. Leader – Mark Cavendish (OPQS). Stage 2: Winner – Matteo Pelucchi (IAM). Leader – Cavendish. Stage 3: Winner – Peter Sagan (Cannondale). 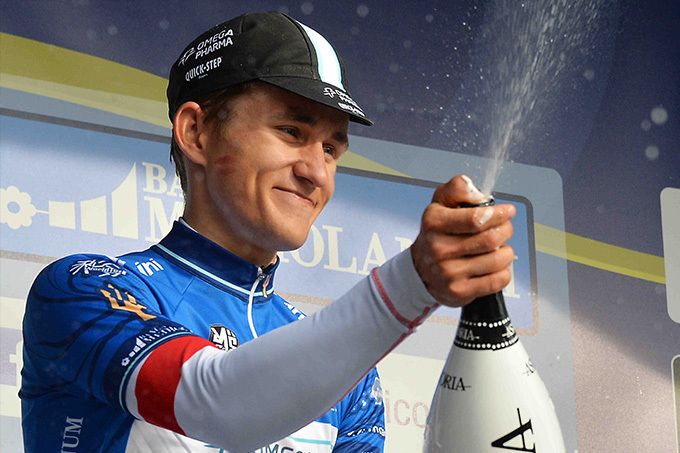 Leader – Michal Kwiatkowski (OPQS). Stage 4: Winner – Alberto Contador (Tinkoff-Saxo). Leader – Kwiatkowski. 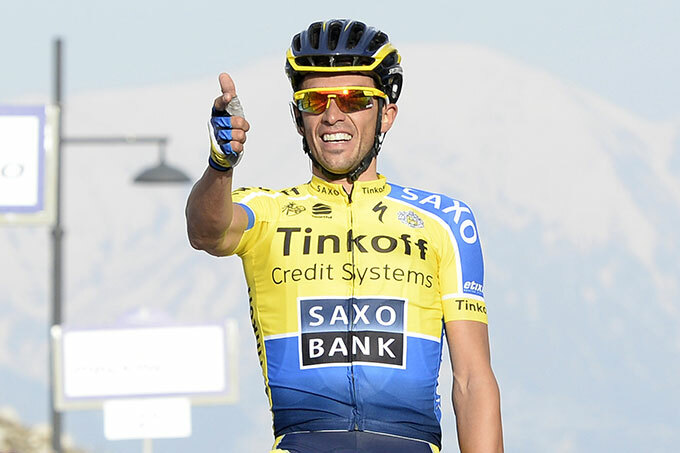 Stage 5: Winner – Alberto Contador (Tinkoff-Saxo). Leader – Contador. Stage 6: Winner – Cavendish. Leader – Contador. Stage 7: Winner – Adriano Malori (Movistar). Overall winner – Contador.